You’re old, you live alone, maybe you lose your glasses a lot or you forget to take your medicine on time. Zacharias the prototype robot of course – at least that is what an EU funded research consortium are banking on. Having a robot follow you around the house and telling you you haven’t shut the fridge door, or it’s dinner time but you still haven’t used the microwave, may sound like a rather alienating experience and certainly not one to look forward to when you’re old. But sadly, the reality is the elderly are more and more often living alone. Worse, in Europe the proportion of elderly in the overall population is growing – as are the levels of loneliness. And the demographics of Europe are set for radical changes in the coming decades. four working-age people for every person aged over 65 years to two working-age people. According to EU Commission data those aged 65 and over will become a much larger share (rising from 18 percent to 28 percent of the population), and those aged 80 and over (rising from five percent to to 12 percent) will almost become as numerous as the young population in 2060. So Zacharias may appear to be an inhumane answer to this demographic problem, but unless family dynamics change – unless adult children or other family members move in with their elderly relatives – then robots may be the least worst solution to ensuring they are not neglected. Zacharias is also being developed to detect diseases as they develop, such as dementia or Parkinson’s disease, by noting changes in behaviour via different patterns of physical movement. As a very sensitive robot he can track the movements and walking speeds of people around him. “He has a 2D laser sensor that he uses to create a map of the surrounding environment,” Roman Navarro Garcia, a robotics engineer at Robotnik, a commercial company involved with the research consortium, told Euronews. Any unusual data is then automatically sent to the family or the person’s doctor to alert them. 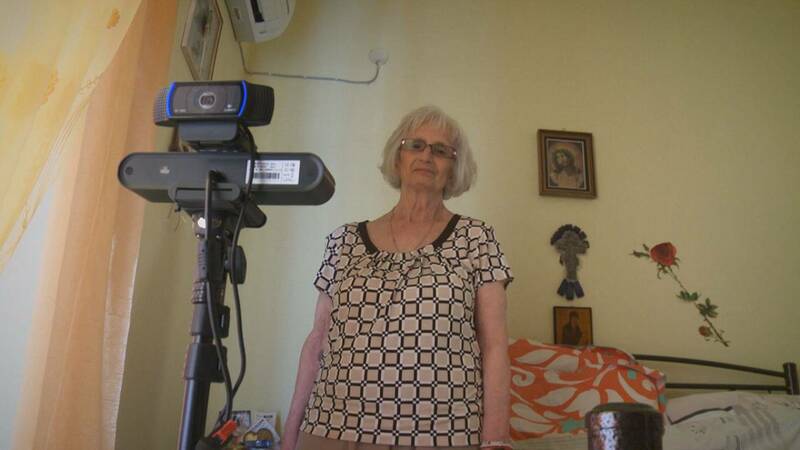 The prototype is now in trials with volunteers, including Aggeliki who is 68 years old and lives alone in her home in Patras, in western Greece. She suffers from mild arthritis but otherwise her health is fine – for now. “The team of scientists has informed me that the robot will record my daily movements to prevent any falls or diseases,” Aggeliki Koukoutsi said. After the trials researchers are aiming to integrate robots into smart-homes to make it easier to more accurately track and analyse the physical behaviours of an elderly person. But it’s still a huge challenge to design a robot that, very much like the elderly person it will care for, needs to be independent. “The robot is constantly moving inside the user’s home; it is totally dynamic; it is not static. But homes themselves are also a very dynamic environment; things move, furniture changes places. There are obstacles, big or small,” Christos Panagiotoy, a Greek computer engineer at ESDALAB-TEI, which is also involved with the consortium said. In Athens researchers are working on ways to improve what they call “perception technologies” in the robot, to make it as unobtrusive and functional as possible. And they also want to produce robots that are affordable. “We are talking about developing a low cost robot. We also want it to be able to easily adapt to different home environments or smart homes. And we want the robot to be user friendly, so it can be easily used by people without too much training,” Vangelis Karkaletsis the consortium’s coordinator said.